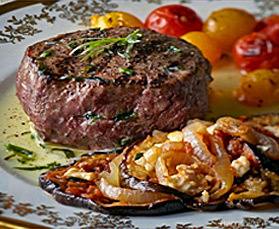 For a savory trio, serve the filet mignon with eggplant and feta casserole and a side of cherry tomatoes charred on the grill in a grill pan. Make a pocket in each steak by cutting horizontally almost to the opposite side. In small bowl combine butter, parsley, tarragon, chive, garlic, 1/2 teaspoon salt, and 1/4 teaspoon pepper. Spoon butter mixture into pastry bag fitted with large round tip. Pipe mixture into pockets in steak. Season steaks with additional salt and pepper. For gas or charcoal grill, place steaks on grill rack directly over medium heat. Cover; grill 8 to 12 minutes for medium-rare doneness, turning once. Garnish steaks with snipped rosemary.